Professor and Coordinator of Instrumental Studies in the School of Music Joel Treybig was recently published in the March 2018 International Trumpet Guild Journal. 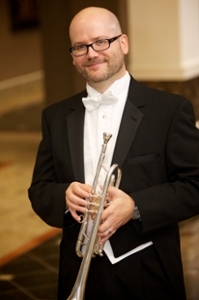 His peer-reviewed article, “Auxiliary Trumpets: Selecting the Best Tool for the Job,” is based on his sabbatical research, explores the origins and history of auxiliary trumpets and the diverse designs of the instruments and examines musical literature to note how these instruments can best be used in modern performance to benefit the composition, audience and performer. The International Trumpet Guild Journal is distributed to a membership of over 4000 members from 50 countries.